Edgar Yipsel "Yip" Harburg (born Isidore Hochberg, Yiddish: איסידור הוכברג‎; April 8, 1896 or 1898 – March 5, 1981) was an American popular song lyricist and librettist who worked with many well-known composers. He wrote the lyrics to the standards "Brother, Can You Spare a Dime?" (with Jay Gorney), "April in Paris", and "It's Only a Paper Moon", as well as all of the songs in The Wizard of Oz, including "Over the Rainbow". He was known for the social commentary of his lyrics, as well as his liberal sensibilities. He championed racial and gender equality and union politics. He also was an ardent critic of religion. Harburg, the youngest of four surviving children (out of ten), was born Isidore Hochberg on the Lower East Side of New York City on April 8, 1896. His parents, Lewis Hochberg and Mary Ricing, were Yiddish-speaking Orthodox Jews who had emigrated from Russia. He later adopted the name Edgar Harburg, and came to be best known as Edgar "Yip" Harburg. He attended Townsend Harris High School, where he and Ira Gershwin, who met over a shared fondness for Gilbert and Sullivan, worked on the school paper and became lifelong friends. According to his son Ernie Harburg, Gilbert and Irish dramatist George Bernard Shaw taught his father, a "democratic socialist, [and] sworn challenger of all tyranny against the people, that 'humor is an act of courage' and dissent". After World War I, Harburg returned to New York and graduated from City College (later part of the City University of New York), which Ira Gershwin had initially attended with him, in 1921. After Harburg married and had two children, he started writing light verse for local newspapers. He became a co-owner of Consolidated Electrical Appliance Company, but the company went bankrupt following the crash of 1929, leaving Harburg "anywhere from $50,000 – $70,000 in debt," which he insisted on paying back over the course of the next few decades. At this point, Harburg and Ira Gershwin agreed that Harburg should start writing song lyrics. Gershwin introduced Harburg to Jay Gorney, who collaborated with him on songs for an Earl Carroll Broadway review (Earl Carroll's Sketchbook): the show was successful and Harburg was engaged as lyricist for a series of successful revues, including Americana in 1932, for which he wrote the lyrics of "Brother, Can You Spare a Dime?" to the tune of a lullaby Gorney had learned as a child in Russia. This song swept the nation, becoming an anthem of the Great Depression. Harburg was a staunch critic of religion and an atheist. He wrote a poem entitled "Atheist" that summarized his views on God and religion. Harburg and Gorney were offered a contract with Paramount: in Hollywood, Harburg worked with composers Harold Arlen, Vernon Duke, Jerome Kern, Jule Styne, and Burton Lane, and later wrote the lyrics for The Wizard of Oz, one of the earliest known "integrated musicals," for which he won the Academy Award for Best Music, Original Song for "Over the Rainbow." So anyhow, Yip also wrote all the dialogue in that time and the setup to the songs and he also wrote the part where they give out the heart, the brains and the nerve, because he was the final script editor. And he—there were eleven screenwriters on that—and he pulled the whole thing together, wrote his own lines and gave the thing a coherence and unity which made it a work of art. But he doesn't get credit for that. He gets lyrics by E. Y. Harburg, you see. But nevertheless, he put his influence on the thing. Working in Hollywood did not stop Harburg's career on Broadway. In the 1940s, he wrote a series of "book" musicals with social messages, including the successful Bloomer Girl (1944), set during the Civil War, which was about temperance and women's rights activist Amelia Bloomer. Harburg's best known Broadway show, Finian's Rainbow (1947) was, in its original production, possibly the first Broadway musical with a racially integrated chorus line, and features his "When the Idle Poor Become the Idle Rich." It was made into a film in 1968 starring Fred Astaire and Petula Clark, directed by Francis Ford Coppola. Although never a member of the Communist Party (he was a member of the Socialist Party, and joked that "Yip" referred to the Young People's Socialist League, nicknamed the "Yipsels") he had been involved in radical groups, and he was blacklisted. Harburg was named in a pamphlet Red Channels: The Report of Communist Influence in Radio and Television; his involvement with the Hollywood Democratic Committee, and his refusal to identify reputed communists, led to him being blocked from working in Hollywood films, television, and radio for twelve full years, from 1950 to 1962. "As the writer of the lyric of the song 'God's Country', I am outraged by the suggestion that somehow I am connected with, believe in, or am sympathetic with Communist or totalitarian philosophy", he wrote to the House Un-American Activities Committee in 1950. He was unable to travel abroad during this period, as his passport had been revoked. With a score by Sammy Fain and Harburg's lyrics, the musical Flahooley (1951) satirized the country's anti-communist sentiment, but it closed after forty performances at the Broadhurst Theatre on Broadway. The New York critics were dismissive of the show, although it had been a success during its earlier pre-Broadway run in Philadelphia. In 1966, songwriter Earl Robinson sought Harburg's help for the song "Hurry Sundown"; the two collaborated on the song and are credited as co-writers. The song was intended for the film Hurry Sundown, but was not used in the film. It was, however, recorded by Peter, Paul and Mary for their 1966 album The Peter, Paul and Mary Album. The song was released as a single in 1967, and reached #37 on the Billboard Easy Listening chart. It was also nominated for the Grammy Award for Best Folk Recording. He died in a head-on collision when the car he was driving swerved into oncoming traffic on Sunset Boulevard in Los Angeles, California, on March 5, 1981. In 1940 Harburg won an Oscar, shared with Harold Arlen, for Best Music, Original Song for The Wizard of Oz (1939). In addition, he was nominated for an Oscar for Best Music, Original Song, along with Arlen, for Cabin in the Sky, (1943) and Best Music, Original Song for Can't Help Singing, shared with Jerome Kern in (1944). Harburg was inducted into the Songwriters Hall of Fame in 1972. On March 7, 2001 the results of a poll conducted by the Recording Industry Association of America and the National Endowment for the Humanities ranked Judy Garland's rendition of "Over the Rainbow" as the Number One recording of the 20th century. On June 22, 2004 the American Film Institute broadcast AFI's 100 Years ... 100 Songs, a TV special announcing the 100 greatest film songs. "Over the Rainbow" was Number One, and "Ding-Dong! The Witch Is Dead" was Number 82. In April 2005, the United States Postal Service issued a commemorative stamp recognizing Harburg's accomplishments. The stamp was drawn from a portrait taken by photographer Barbara Bordnick in 1978 along with a rainbow and lyric from "Over the Rainbow". The first day ceremony was held at the 92nd Street Y in New York. Ziegfeld Follies of 1931 (1931) - featured lyricist for "Mailu"
Americana (1932) - lyricist. The Revue include "Brother Can You Spare a Dime?" At Home With Ethel Waters (1953) - featured lyricist for "Happiness is a Thing Called Joe"
^ a b c "E. Y. Harburg, Lyricist, Killed In Car Crash". The New York Times. March 7, 1981. Archived from the original on July 15, 2012. Retrieved 2010-11-30. ^ a b "Who Is Yip". Yip Harburg Foundation. ^ a b "E.Y. (Yip) Harburg". Freedom From Religion Foundation. 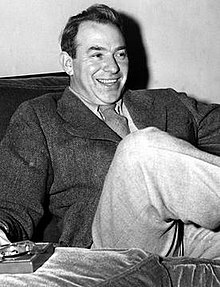 ^ a b Yip Harburg: Biography from Answers.com. Retrieved January 2, 2010. ^ E. Y. Harburg. Retrieved from Notable Names Database on January 12, 2010. ^ Songwriters Hall of Fame - E.Y. Harburg Biography Archived 2010-12-18 at the Wayback Machine. Retrieved January 2, 2010. ^ Yip Harburg biography Archived 2009-08-29 at the Wayback Machine. Retrieved January 2, 2010. ^ Kathleen Phillis Lorenz (1981-03-05). "Spotlight on E. Y. Harburg". 42ndstmoon.com. Archived from the original on 2012-02-07. Retrieved 2012-07-31. ^ a b "Democracy Now article 25, November, 2004". Democracynow.org. Archived from the original on 2007-11-14. Retrieved 2012-07-31. ^ Leigh Donaldson "Yip Harburg: Father of the Socially Conscious Lyric", American Songwriter, April 17, 2011. ^ Harold Meyerson & Ernie Harburg (1995). Who Put the Rainbow in the Wizard of Oz? : Yip Harburg, Lyricist. The University of Michigan Press. p. 326. ^ "See this for a picture of the Yip Harburg commemorative and a description of the campaign to have it issued". Thefastertimes.com. 2009-11-01. Archived from the original on 2012-07-31. Retrieved 2012-07-31. Yip Harburg - Brother, Can You Spare A Dime? This page was last edited on 11 March 2019, at 22:08 (UTC).